I’ve just made two herb-infused base oils, Marigold and Lavender. Base oils are great for making your own creams, massage oils, salves, liniments, plaisters and even suppositories for your first aid kit. 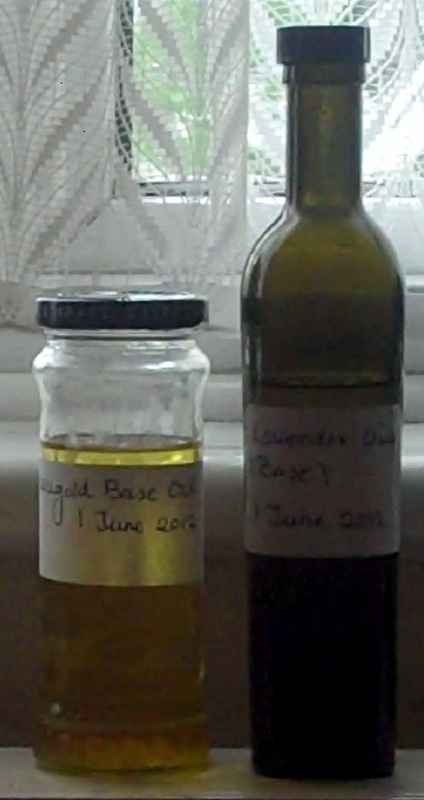 You can also make your own skincare products like moisturisers, cleansers and lotions with these base oils. I prefer to make my oils rather than buy them, at least I know the herbs are good quality with the therapeutic properties I expect. To make the base oil, use a light vegetable oil like sweet almond oil, jojoba or sunflower oil. I use Lavender oil for calming hot red and inflamed skin. It has antiseptic properties and can be used for the relief of mild burns. It can also be used in the relief of muscular aches and pains, headaches as well as cuts, sores and varicose ulcers. I also use it to make facial creams and moisturisers to relieve eczema and acne. Marigold is anti-viral, anti-fungal and anti-bacterial. I use it to help wound healing or where there is eczema, acne and psoriasis. Marigold is great used in creams for burns, cold sores, sunburn, bee stings, bug bites and rashes and dry itchy skin. To make the oils, Fill a clean jar with an airtight lid with a handful of marigold flowers and add the oil. Make sure the oil covers all the plant material otherwise you might get mould growth. Dried herbs: 50-75g / 2-3oz. Fresh herbs: 75-100g / 3-4 oz). Vegetable oil: 300ml / ½ pint / 1 ¼ cups. It’s important to get the best quality ingredients (especially the herbs) to get the best results, so please don’t skimp on this. Use organic or wild-crafted herbs. Steer clear of herbs treated with pesticides. Make sure the marigold flowers you use are bright orange-yellow in colour. They should also have a sweet, pleasing odour! If you’re making lavender oil, the flowers should have a strong scent of lavender. I always use dried flowers, but if you are using fresh you need twice the amount (see above for measurements). I had run out of the slender, dark-green bottles I’d bought for my oils, so just used an old jam jar with an airtight lid instead for the marigold oil. Leave the jar on a windowsill in direct sunlight until the oil changes colour. I left mine for about six weeks (be patient!). Strain the oil through a muslin cloth. Decant into a dark bottle if you have one – dark bottles are best as they protect the oil from degrading through sun exposure, otherwise any airtight glass jar will do. Label the jar with the date the oil was bottled. Store in a cool place away from sunlight until needed. The oil will keep in these conditions for about a year. Inspired by a life-long interest in health, I worked as an NHS medical secretary for 20 years. After experiencing the power of herbal remedies for myself, I trained as a medical herbalist, graduating from Westminster University in 2004. I’m a member of the College of Practitioners of Phytotherapy (CPP); a governing body for qualified medical herbalists. I’m a firm believer that you have the power to make profound changes, and I aim to support you on your journey - and help you resolve on-going health problems. I have published several articles and have served as health expert for Holland & Barrett's Healthy magazine. At a local level, I regularly dispense health advice in a health food shop. I have recently developed my own range of natural skincare products, Clay & Herbs. You can also find a wealth of information on medicinal herbs and a variety of health topics on my website: www.greenleavesherbalhealth.co.uk. Interesting tip. I’ve always been wondering about making my own skin care concoctions. Partly because it’s hard to find good stuff from the stores. Couple of questions. You are not worried about the oil degrading while sitting in direct sunlight? Light vegetable oils, like almond or sunflower, contain PUFAs that are quite fragile. Vegetable oils are often also damaged during processing and extraction phase. So one has to be careful while choosing the oil. Putting oxidized oil on the face could spell disaster. Also, do you have any problems with skin penetration. One problem I’ve always ran when thinking of homemade skin care is how to get them to penetrate the skin. Any ideas on this? Hi Seppo, good to hear from you! To answer your questions – I keep the oil in a cupboard away from direct sunlight and I use dark-green bottles, which also protects the oil from degrading. I always label the bottle with the date and keep them for a year. You could keep them a bit longer because is fairly easy to tell if an oil has gone rancid. If you wish you could add 10% of wheatgerm oil to the total volume of the oil to prolong the shelf life. Hope this helps! If you’ve made your own creams and they are not penetrating the skin then perhaps it has not emulsified properly. Make sure you use enough emulsifier (natural, of course). I’ve made plenty of moisturisers which absorb into the skin without trouble. Thanks for your reply. But you are not worried that the oils go rancid as they are sitting on direct sunlight ‘until the oil change colour’? Sorry, I misunderstood your earlier question. I use light oils Almond, Jojoba, Sesame or Grape-seed oils, which tend not to go rancid. I would not use olive oil, as this is quite a heavy oil and more prone to rancidity. You can also add a few drops of Vitamin E oil which acts as a preservative, before you put your oil to steep with the herbs. Also, make sure there are no air bubbles in the jar when you are making the oil. If you don’t want to leave oils in the sunlight (or if there isn’t any!) you can also make your oils by leaving them by the radiator for the required time or heating them gently instead. Sorry for the earlier confusion!